Managed by same internal person. As I’ve dug through data, I’ve begun to realize that our event reporting is inconsistent between OSes. Event labels have not been given precise and clear definitions. This is going to be a significant hurdle, so I’ve been seeking to sort that out first. The first sign of problems was discovered during the final feature build before the research project was to begin. One part of the feature integration was adding an icon/button to an already-crowded interface. The new feature was one that was to be highlighted as it was a part of an integration with an app that we wanted to promote the use of. It was clear that we were going to need to consider placing one or two previously-existing icons within a context menu to make room for the new one. We did not have the time resources to run a round of user testing to help determine how which ones were going to be harder to find, so I was asked to make recommendations based on analytics alone. Of all of the events possible to perform with the icons on the taskbar in question, the “Sharing – Generic” action was reported as 90% of all actions. Of the “Sharing – Generic” actions, 90% of those were Android (Android user share was ~65%). For all other actions on this taskbar, 90% of the events were iOS. “Sharing – Generic” was 98.5% of all Android actions for this taskbar. “Sharing – Generic” was 30% of all iOS actions for this taskbar. The UI for the two OSes are different but do not seem different enough to warrant such vastly different event reporting numbers. I met with the development teams and discovered that they were using “Share – Generic” in completely different ways. For Android every single time a user touched this button it logged “Share – Generic” and only that event. For iOS they were logging it only if it was successfully shared using an app outside of the ones that had their own specific sharing event assigned, e.g. “Sharing – Facebook”, and some recent versions of the app logged the string of the app name, e.g. “com.apple.reminders.RemindersEditorExtension”. Prior to this point, I didn’t have access to some of the analytics platforms. I had previously been assigned only as a UI designer and was still onboarding into the UX role. I was granted access to Adobe Analytics and Flurry. The learning curve on AA was too steep for the quick turnaround that was necessary for the project, and I discovered that Adobe wasn’t consistently logging events to Flurry at all. I decided to stick with GA to pull out the data that I could to begin a full event-logging audit. All events logged in 2017. “All Event Labels 2017” – Unique event labels and total events logged for each across all OSes and Versions used in 2017. “All Event Labels 2018 Releases” – Unique event labels and total logged in each app version released in the first 5 months of 2018. “Android Only”/“iOS Only”/“Both” – Which events were common or unique to either OS, that is which events were only logged in only Android, only iOS, or to both. I have asked the developers to look through the lists and confirm which ones should belong where along with notes of data parameters that are currently being collected with each. After determining which ones are currently in use, I will work with the developers to define clearly what should trigger each event, which events need to be added, and how to sync up the two platforms to make sure they’re reporting the same, or at least functionally equivalent data. A friend of mine posted a review of the book PROOF: Finding Freedom Through the Intoxicating Joy of Irresistible Grace. While I sometimes struggle with this particular doctrine, I find it often very encouraging. I would like to share one of the quotations that he also shared. One of these days I might ask him to borrow this book. A picture in front of KinderCare last night. Taken by @MarinaMarraco. Fia is a funny little kid, a few weeks ago she asked me to “put talking on” – we were listening to her favorite Spotify mix, but she wanted some NPR. On Monday I dropped off my daughter at the preschool/daycare she goes to two mornings each week, this morning there was some piece about Sandy Hook on as we were pulling into the parking lot of her daycare in Winter Park, FL and I thought of all of those parents who sent their kids to school that day and never heard their voices again. Fia walks and runs like a champ, but she wanted to be carried in that day and I was more than happy to hold and hug her tight on our way in. Wednesday afternoon, after we’d picked her up from daycare, after hearing about the stabbings west of Pittsburgh, I got a call from a friend asking where Fia’s preschool was and if she was there. He said something about a car running into a daycare in Winter Park and that kids were hurt. Even though I could see her curly mop focused on Daniel Tiger’s Neighborhood, my heart dropped out. The Winter Park KinderCare is less than a 1.5 miles from Fia’s school. As we drive there, I know that we pass cars carrying kids that are headed to KinderCare. There are definitely children that live in our neighborhood, it’s just too close for there not to be. As I carried my first baby in on Monday I thought about how much her absence would wreck me, not just her being at school absence or her one day going to college absence. But, if she was gone. If she was taken like little Lily Quintus is, the child killed by some big jerk with a big ego in a big truck, one of two things would likely happen. I’d either turn into Liam Neeson from Taken, but without the “particular set of skills,” or I’d end up a kind of empty shell for a while. I’d snap out of it eventually, I’d have a wife to love and comfort, a son to raise, and most importantly I have a God that is merciful. I’d eventually get to the point that King David did when his first son died, believing that I will see her again. I don’t have a point that I’m aiming at. I’m just processing a little. I used to get mad at these kind of things happening (I still do), but more and more often they lead me to hug my wife, my daughter and my son tighter and to try to soak up every minute we have. I hope they find Robert Corchado, if it turns out that he really is the guy that caused this I hope they throw the book at him. I hope he goes to prison and is known as the guy who killed a 4-year-old. Eventually, my anger turns to mercy, my rage to forgiveness, my desire for justice for my desire for the same mercy that has been shown me by this God that sees the depths of our hearts and still calls to us. Driving cars off the road. Shooting kids. Stabbing classmates. Escalating fights to the point of violence at work. But for the Grace of God, there goes Jayson Whelpley. 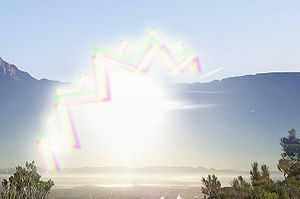 Scintillating Scotoma as imagined by Wikipedia. I do believe that there have been a few times in my life that I’ve been distinctly ‘spoken to’ by God, but the how of His voice in my life are not always easy to explain. Recently I came up with a way of describing it that is no less subjective, but, perhaps, somewhat illustrative. God’s voice is like a migraine. When I first got my migraines in 2004 they came on pretty gnarly, so bad in fact that I ended up getting tests done to make sure I didn’t have a tumor. They would (and continue to) start with what experts call a scintillating scotoma or a migraine-aura (see the image above) and every once in a while with one side of my face or a few fingers in my hand going numb. Thankfully, the tumor-fear-inducing numbness is now far more rare. This is how I first started knowing that my day was ruined… I wasn’t going to be able to read anything the rest of the day, driving was going to be difficult for at least a half-hour. Day ruined. Nine years later, I can see them coming 5 minutes away; that is 5 minutes before my vision gets all trippy. I don’t have any way of describing what I’m feeling, but I have close to 100% accuracy of feeling it coming before it does. Even more so, I can always tell when it’s going to go away about 10-15 minutes before it does. For three of those years, we lived in the Washington, DC metro area. I’d never really had experience in living in a legitimate city – the public transportation and eating-out options are still life-changing experiences in my life. Living in a city with a ubiquitous population of homeless people was even more life-changing. People often have “rules” about how to deal with people asking for money on the street. I am not really a “rules guy,” but I am a “systems guy.” I like having processes to solve problems, I don’t like always/never guidelines. So, I had to come up with a guideline for how to deal with the situations. It seems clear to me from the Scriptures that followers of Jesus are to care for the poor, but there’s debate whether giving money is a good thing at all and I don’t know what the answer to that is. But, I believe there is a “best” in every situation and that the Lord was willing to tell me what that was. The only always/never rule is that I will always buy a new issue of Street Sense from a vendor with his license/ID displayed. They have to actually ask for money or something else. If they ask, I will quickly pray and ask God what I should do. I do what I’m told. It was amazing how often I got to pray this prayer. On Metro days (as opposed to driving days) I would walk by at least 10 people asking for something. Over the three years, I probably prayed the prayer more than 1,000 times. Still, it took about a year, but I actually found out that Jesus’ promise that His “sheep hear [His] voice” was true! I honestly would get an answer just about every time. That bill ended up being a $20. That last one will be one of my life-long regrets. I didn’t. I think that we often struggle with hearing from God. How often have you bounced back and forth between “yeah, I think that’s the Holy Spirit,” and “nah, that’s just my own thoughts.” (It’s funny how often “it’s your own thoughts” when it’s something that is stretching or distasteful.) But, I know His voice now! When I hear it, I know it like I know my dad’s voice , my uncle Dal’s voice or my brother’s voice – a voice that kinda sounds like my inner voice, but it’s definitely not! It’s not that sneaking voice that entices me to stay on that show a few more minutes or to have just one more of whatever. That voice sounds like mine as well, but is far too easy to hear and far too similar to what I want to do anyhow. You have to keep practicing. I loved our three years in DC. They were formative in a number of ways and I am hopeful that one day we’ll move back. But, even if we don’t it will still reside in a foundational location in my life it was the place I learned to hear God’s voice, tutored by the 7,000 or so homeless residents of the area.